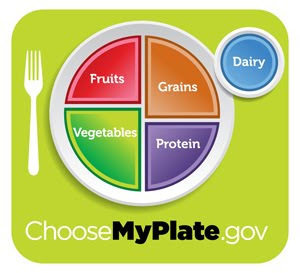 Weighty Matters: MyPlate - America's new, irrelevant "food icon"
A great many folks have been asking me to weigh in on the new American "food icon" My Plate that was launched last week. It's worlds better than the confusing pyramid it's replacing. It can theoretically actually help guide what a person might put on their plate without requiring them to wade through pages of reading (like Canada's Food Guide does). Its simplicity is certainly its greatest strength. Nutritionally though, it does fall down some, and while I could get into nitty gritty, I've only got three to really harp on starting with the full plate itself. While it may sound ridiculous, I don't think that encouraging a full plate's a great plan. The fact is, we've got big plates, and while the accompanying website does provide caloric guidance, all the MyPlate icon does is suggest your plate should be full. The second is that like our Food Guide, it doesn't provide much guidance as to the quality of different types of proteins, fats and carbohydrates. Lastly, I don't think milk/dairy deserves it's own billing as dairy's just a protein source with calcium, and not a magic fairy food that confers the health of immortal unicorns. But really, it's the broader picture stuff that really matters, as this food icon does nothing to actually address the underlying problems we've got nutritionally in society. It's for that reason why even if it manages to affect plate level changes, America will remain massively messed up nutritionally (not that we're any better). It doesn't address crop subsidies that make highly processed food incredibly cheap to produce and purchase. It doesn't address the fact that on an annual basis the amount of food dollars we spend outside the home are growing. It doesn't address the fact that home cooking is a dying art and that the food industry has hoodwinked many of us to believe that opening a few boxes and mixing things together actually counts as cooking. It doesn't address the fact that we serve our children nutritional garbage in schools. It doesn't address the nutritionism that among other ridiculousnesses, has folks championing chocolate milk as a means for kids to get calcium. It doesn't address the front-of-package health claims that help to sell foods by means of their health haloing effects. It doesn't address predatory targeting of children by Big Food manufacturers. But of course, how could it? Ultimately our respective Food Guides and Plates? They can't change the world they're being brought into, and until there's a concerted effort brought to bear to change our world, we aren't likely to see much in the way of useful dietary change.